At the end of the eighteenth century, the Grand Duke Peter Leopold ordered the building of the so-called “monumental staircase”, a new entrance to the gallery. At the same time this room was created, the vestibule entrance. Today this space – where there is the door through which you enter the museum, topped by the bust of Peter Leopold - hosts a number of marble statues from the Roman era: two dogs, mastiffs, some human figures and an Apollo, and several sarcophagi. According to some scholars, the two dogs come from a group of sculptures depicting a hunting scene, while others think that they were part of a funerary complex. There are also some busts, representing some members of the Medici family, including that of Lorenzo the Magnificent, made by Ottavio Giovannozzi. On the walls, finally, we admire two paintings by Jacopo Chimenti, known as Empoli. The paintings depict the marriages of Caterina and Maria de\' Medici. 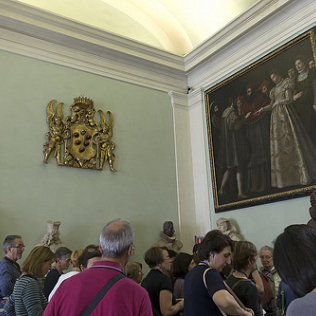 The Uffizi welcome visitors with a part of the ancient collection, and with a part of the Medici family to welcome art lovers.